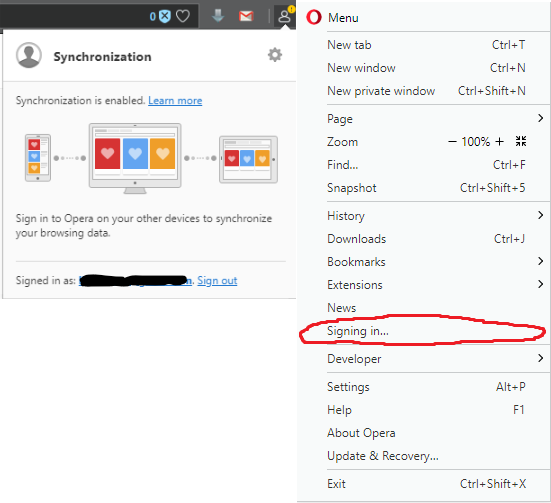 Hello, I just reainstalled my OS, and realised that Opera Snychronization somehow deleted all of my settings, bookmarks and so... But, there's an icon of synchronization with yellow exclamation mark on top right that singalizing some error maybe? I also checked the https://sync.opera.com/web/# but all I can see is zero for every item. Can anyone confirm some issues with synch servers? @clasius-sanqtie If https://sync.opera.com/web/ shows nothingh them you probably don't have any synced data. Sync was enabled before you reinstalled the OS? If you click on the sync icon, does it says something? Sync was active before reinstall OS. Never turned it off, nor delete any data. I did reinstall OS many times before and never got any failure with synch... I thought it could be some issues with synch server but it lasts for 2 days now. I think I'm fucked somehow. There was around 100+ bookmarks I lost. @clasius-sanqtie It seems a problem connecting to the server or logging in to it. ry creating a new account to test. Newly created account is synchronizing without any problems. As of now, the synchronization has started working again.